The Mothers’ Grove is located across from and a few steps north of the entrance to the Mausoleum. The grove is easily distinguished by the eye catching stone and metal sculpture “Half Moon” created by Guelph metal artist Steven Cooper. The artist donated the sculpture as an anniversary gift to the cemetery in 2004. Also in the grove is a granite bench donated by former MPP Harry Worton in memory of his wife, Olive. The flowering trees and shrubs in the grove are planted at the Mothers’ Eve ceremony held each year in May. There are several bronze plaques in the grove with inspirational and touching phrases honouring motherhood. In the heart of the cemetery, the Mothers Grove provides a quiet and comfortable place to sit and listen to the birds, not the traffic, of the city. The stained glass at Woodlawn Memorial Park was restored in 1994 at a cost of $7500.00. It was originally designed and assembled by renowned artist James Blomfield (1872-1951), a glass artist who ranked one of the top two in Canada in c1895-c1930. James and his brother Charles pioneered the craft of leaded glass art in British Columbia in the 1890’s. James received training in Europe and much of his work can be found in prestigious buildings throughout Canada and the United States. James moved to Toronto in 1920, where he lived out his life concentrating mainly on fine art. 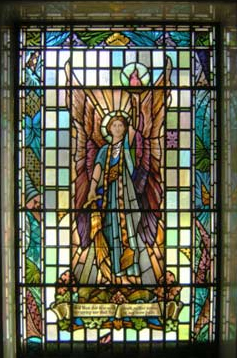 He did occasional glass work for the Luxfer Studios in Toronto and it is believed he contracted for the Woodlawn Mausoleum windows at that time. The cost, for the large window in the chapel and the two large windows in the wings (one shown), was a mere $923.00 – considered a bargain even in those days. The Woodlawn Park Mausoleum provides an elegant, stately atmosphere for families who wish to hold private services. In 1921, in a quiet site that borders between two older areas, a vault was constructed to place the remains of very young or still born babies. Unfortunately, no means of commemoration was established at that time. In 1997, after extensive research revealed more than 900 babies had been placed in that area over the years, a monument was erected and a beautiful garden designed. 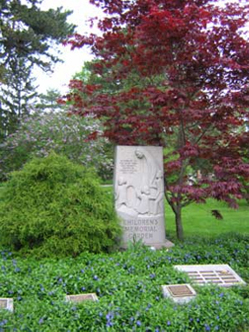 The Children’s Memorial Garden was dedicated on October 9, 1997. On a cold, blustery afternoon many people placed flowers in honour of the children buried there. The Children’s Memorial is but one of the many pieces of public art to be found in Woodlawn Memorial Park. A Public Art in Woodlawn brochure is now available (and free!) at the cemetery office. You can place a plaque in the childrens’ garden in remembrance of a child. The child need not be buried in Woodlawn. Your plaques, 2″ x 6″ will be added to one of the granite slopes in the garden. 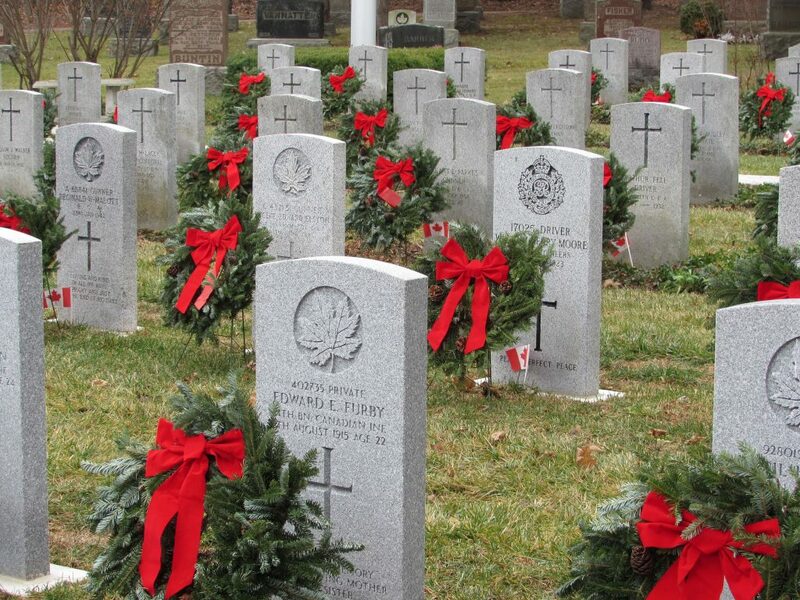 Woodlawn Memorial Park in Guelph is the only cemetery in Canada on the Trans Canada Trail. 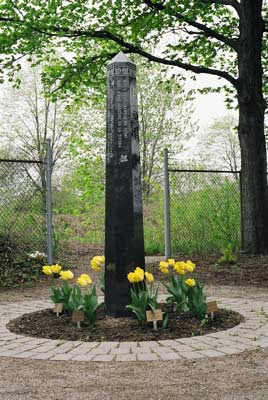 The north entrance of the Trans Canada Trail in Woodlawn is marked by the “Peace Pole” and is located in the North West corner of the cemetery, on the east side of the train tracks. The 7’ high granite Peace Pole is a monument that displays the message & prayer “May Peace Prevail on Earth”. Dedicated in 2002, designed by Guelph artist and retired Woodlawn Memorialist Ceska Brennan. Our pole shares the message in 18 different languages. There are more than 100,000 Peace Poles in 160 countries all over the world dedicated to peace. They are in simple places such as churches and gardens but in extraordinary ones too, such as the Pyramids of El Giza or the magnetic North Pole in Canada. We believe when we plant a Peace Pole we are linking with people all over the world who have planted their poles in the same spirit of peace. When we stand on the Trans Canada Trail we are linking with people across Canada in the spirit of preservation and love of our great country. We have included a paw print and leaf to represent our wish for the peaceful co-existence of humanity with both the animal and plants of our planet. Many people use the cemetery for leisure. Walking clubs, joggers, children and adults alike treasure our winding roadways for exercise or pleasure. Woodlawn Memorial Park is a multicultural cemetery, welcoming people of all faiths. The Dodds Reflection Garden is located in the Cremation Gardens. It links the upper and lower gardens. 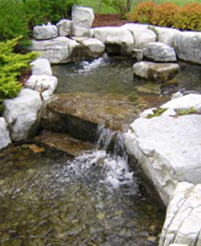 This charming waterfall tumbles its way from the Cremation lawn to the more formal areas of the Cremation Garden. The waterfall, immediate surrounding garden and bubbling fountain are a living memorial for Douglas Dodds Senior who died in 1996. Dodds worked for the Guelph Post Office for more than 40 years. As the manager of the wickets, he was a familiar figure in Guelph and known to many. Arthur William Cutten was born in Guelph in 1870. The second of the eight children of Mr. and Mrs. W. H Cutten. Cutten moved to Chicago as a young man of eighteen. Throughout his life, he amassed a great fortune in the grain market. He was known as “The little giant of the wheat pits” during the 1920’s. In the summer of 1918, Cutten presented a $10,000.00 cheque to W.E. Buckingham, a solicitor, to be used for improving and beautifying the Guelph cemetery. There was only one condition, that a commission be appointed to make arrangements for the future maintenance of the cemetery. Cutten made subsequent gifts to Woodlawn. 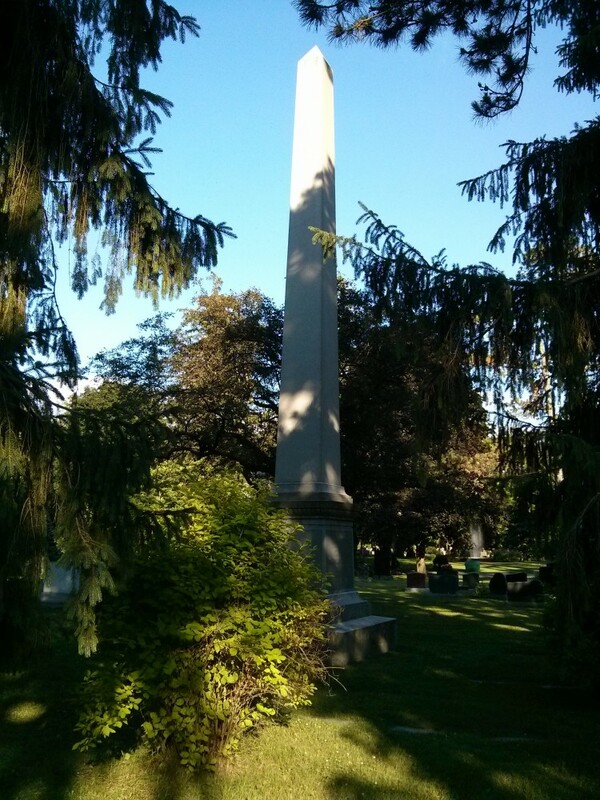 Arthur Cutten has been featured on several of the walking tours at Woodlawn Memorial Park, a large granite obelisk marks the family plot in Block Q. 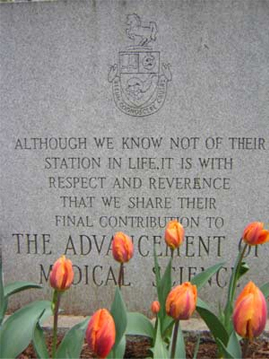 Although first dedicated in 1968, the monument stood unadorned for many years until 2004, when the present garden was designed and planted by volunteers from the University. Prof. Maurice Nelischer, for the University’s School of Environmental Design and Rural Development re-designed the grave site with assistance from Prof. Terry Graham, Chair of the Department of Human Biology and Nutritional Sciences and Paul Taylor, Manager of Woodlawn Memorial Park. The large bed is filled with hosta, astilbe and periwinkle. There is a plaque for families who wish to acknowledge individuals interred in the lot. This is the final resting place for the remains of over 170 individuals who had donated their body to science. The bodies were used in the University’s human anatomy course. When unclaimed by family, the remains of donors were interred within the triangle property.